Calling all aspiring interior designers! 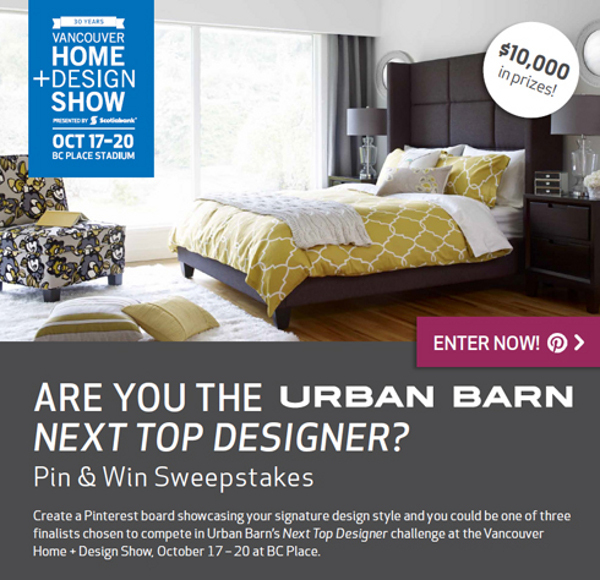 Vancouver Home + Design Show and Urban Barn are partnering up to look for the next big interior design star. From now until Friday July 19th, decorators and designers can enter the competition by creating a Pinterest board showcasing their decor style and filling out the online form. From there, three finalists are given a $5,000 budget for Urban Barn furnishings and must create their dream living room to be showcased at VHDS this fall. VHDS goers will vote on the winning design, which will end up in Urban Barn stores. Exciting stuff, no? Enter now!